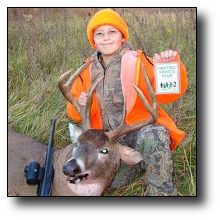 On the morning of November 1st, my ten-year-old son Seth shot another great Missouri buck during the Youth Season. This makes him three for three in as many years of deer hunting. Early the next morning, as we watched the natural world come to life for the day, a Great Horned Owl landed in the tree ten feet above our heads. I squeaked with my mouth a bit and gently rustled the fallen leaves with my boot and the owl closely stared at us for a few minutes before taking flight again. Seth said "That was soooo coool!!!" I asked him "Better than seeing a monster buck?" He replied "Well, better than seeing a doe." A couple of minutes later I spotted a nice buck sneaking through the CRP about eighty yards out in front of us. Its antlers blended in with the surrounding grass on the hill behind him, so I couldn't tell just what kind of a rack he had. But we weren't going to be picky. Any deer was fine. I whispered excitedly "There's a buck! Get ready!" It was steadily walking toward an area that was clear of brush and branches and I knew I had to stop him soon so he could get an open shot. I quickly grabbed a grunt tube out of my backpack and gave it a blow. The buck didn't hear me so I blew again a little louder. It kept on walking. So I blew once again even louder still. He finally stopped and looked our way but it was too late. He was past the clearing and branches from a near-by tree were partially covering him. As I nervously sat there thinking he was as good as gone and safe from any harm POWWW!!! My son shot and the buck folded like a house of cards! Surprised, I turned to Seth and asked him "Where did you shoot him?" He said "Well I looked through the scope and I saw the patch of white hair on his neck through a hole in the branches and I figured it would be a good place to shoot him." I didn't know what to say. I've always taught my kids to shoot deer in the ribs behind the shoulder or in the chest. But the buck was down so, what could I say? "Nice shot!!" Sometimes you just have to improvise and do the best you can with what you've got. We waited and watched the spot in the tall grass where the buck fell for any movement. Suddenly we saw a buck very close to the spot we were watching and I thought that his deer had gotten up. Seth said "No Dad, that buck is smaller." He was right. This buck was obviously smaller with a basket 6 or 8 point rack. After waiting about 15 minutes we slowly walked to where his buck fell and when we got about ten yards from him he tried to get up but quickly fell back. We could see then that it was a very large buck with a great, thick, and dark 8 point rack. It tried very hard again to rise and thrashed around with heavy breathing and big wild eyes. I said to Seth "You'll have to finish him off." He replied "Yeah, I have to put him out of his misery." I could see he was a little shaken. He's never had to do that before. But he stepped forward and shot the deer in the only spot he had a good line of sight, in the ribs, behind the shoulder. The buck coughed a few times but soon died. I asked him if he was okay. And he replied "I'm okay Dad, I have no shame. I'll probably have to do that again some other time in my life. He's a nice buck isn't he?" I said "Yes he is Seth, and I'm very proud of you." After taking pictures and the gutting, dragging and loading, we called everyone we could think of and started for home. I can't say for sure how much this brute weighted, but it took every ounce of energy and strength I had to drag and load it on the carrier of my SUV. I'm positive it went well over 200 pounds dressed out. We stopped at the closest gas station to wash up and several people made a big deal about his buck and congratulated him. We also got passed by some hunters on the highway and they gave Seth a big "thumbs up." It was great to see him get some positive attention from an understanding public. I hope all young hunters can experience that at least once. Being such a warm day, with help from Seth's older brother and sister, we hung, skinned, and quartered it. Seth's Mom and I decided we would splurge a bit and get it mounted for his next birthday present. It is days like these that make life worth living and I'm so glad HSP helps me make it possible, so I can share it with my kids.